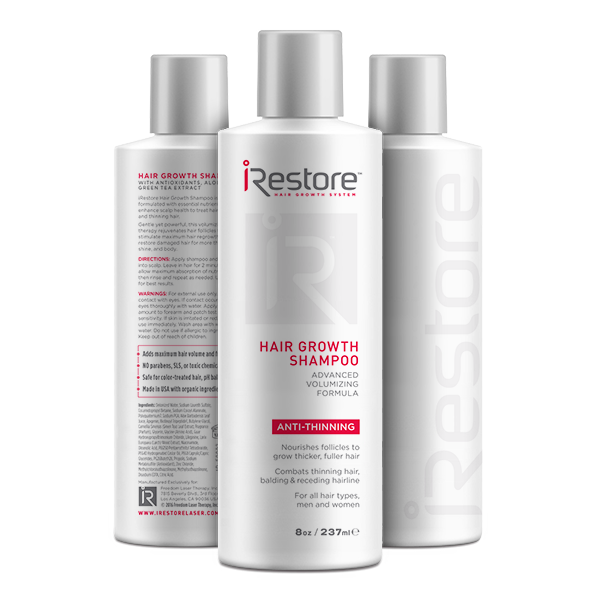 For those looking to grow thicker and healthier hair due to thinning hair, Freedom Laser Therapy, maker of the FDA-cleared laser hair loss medical device, the iRestore Hair Growth System, announced its latest hair growth product, the iRestore Hair Growth Serum. My hair has always been a huge point of annoyance for me and I wanted that to change. I have naturally curly and frizzy hair and my husband likes to say that when he met me when I was a teen that my hair was bigger than my body. My hair always stood out, having a life of its own, while a large majority of my classmates had stick-straight hair that I craved. I have done everything you can possibly do with your hair over the years; I’ve had many colors, styles, and cuts both good and bad. My hair and I settled on a routine where I’d get regularly scheduled highlights and straighten the crap out of it with my Chi flat iron and I was starting to notice that my hair was beginning to fight back. The constant humidity of Austin and the styling/treatments has made my locks angry! On top of that, I am inching closer to 40 and I get the random gray hair that I will pluck out if I see it. That’s a no-no! Apparently, plucking out hairs can permanently damage your hair follicles and at some point I had to think about making my hair healthy instead of just giving it a vain non-gray appearance of fried straight hair. Somehow I had to reconcile my wish for what I wanted for my hair and do what was best for it. My First Thoughts: Thicker, Fuller Hair in 3 Months. Really? Let’s test this out! The Hair Growth Serum was developed using an advanced thickening formula, Redensyl®, that is clinically proven to stimulate hair growth for both men and women. The iRestore Hair Growth Shampoo is an advanced volumizing therapy that revitalizes hair follicles—perfect for thinning hair. This shampoo is engineered in a medical lab in the United States and uses essential nutrients to strengthen hair roots to prevent hair loss, dryness, and breakage. The shampoo lathers perfectly and emits a subtle fragrant scent that is refreshing, gentle, and suitable for both men and women. It is pH balanced, safe for color-treated hair and compatible with all hair types. Our products are made with high quality ingredients that are non-invasive and 100% safe. Our goal is to provide our customers a hair restoration experience without the negative side effects or increase in health risks in the long term. We are adamant about improving your appearance through the right methods, so you can look good and still maintain great health. The Hair Growth Serum is formulated with patented molecules, Redensyl® and Vitamin E & B, designed to reactivate hair stem cell activity and nourish hair follicles to promote optimal hair growth. By applying 1ml two times a day directly onto the scalp in areas of hair loss, users can expect to see significant visible results in as little as three months. The iRestore Hair Growth Serum is developed and made in the United States. It is sold for $39.99 for a 2oz. / 60ml bottle and is available for purchase now on iRestore’s website. I recently had the privilege of using a 30 day system to help regrow and create thicker hair and I was amazed at the result. My beef was that the system was ONLY for 30 days. I wanted more! The Hair Growth Serum works for THREE MONTHS and I wanted to continue the process in my hair. The results have been amazing and there is little to do except wash your hair as normal but add a little extra time to let the serum soak in. I probably don’t need to mention that I have been amazed at how my hair is back to the same thickness and softness as it was pre-kids. If you are a mom that has struggled with hair loss (darn those pregnancy hormones) and want to get your hair groove back, I suggest trying the Hair Growth Serum by iRestore first before taking any additional dramatic measures. I think you will be pleasantly surprised like I was to find that a serum was all I needed to feel confident in my hair once again. AMAZING! About Freedom Laser Therapy: Freedom Laser Therapy is a Los Angeles-based company that develops and markets cutting-edge light and hair therapy products that improve consumer health and beauty. The company hopes to inspire customers to care for their appearance and well-being in a reliable, health-conscious way. Freedom Laser Therapy was founded in 2003 by CEO Craig Nabat who, having struggled with hair loss and quitting smoking, was determined to find solutions to both challenges—and so he did with the iRestore Hair Growth System and Freedom Quit Smoking System. Nabat is a serial entrepreneur and was featured as the October 2015 cover story of Inventors Digest. Freedom Laser Therapy has been featured by The Doctors TV, Access Hollywood, Huffington Post, VH1, TLC, Fox News, and CBS. To learn more, visit http://www.freedomlasertherapy.com/.